Are you in the mood for a duo of sweet and steamy stories? Linger, an anthology featuring Maya’s stories Songbird and Stay With Me, was just reissued in both digital and print formats as an Amazon exclusive. Is it already in your collection? If not, you can get started with an excerpt and then order yours. Kindle Unlimited subscribers, rejoice! You can read Linger right now as part of the program. Maya is on Kindle Unlimited! 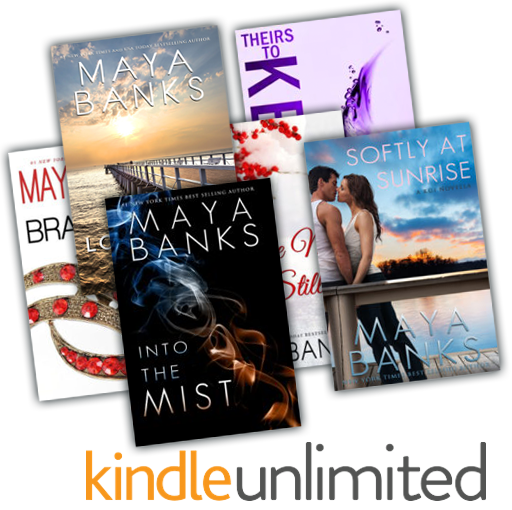 Six of Maya’s books are now exclusive to Amazon and their Kindle Unlimited program for a limited time! If you subscribe to Kindle Unlimited, enjoy! A reader favorite story by #1 New York Times and USA TODAY bestselling author Maya Banks! A Contract Engagement has been reissued in digital format with a new cover and will be available January 14, 2019. If you haven’t yet enjoyed Celia Taylor and Evan Reese in this fake engagement story, read an excerpt and pre-order your copy today! Wow! Load up your e-reader with 6 Maya classics for $0.99 each! Continue reading Wow! Load up your e-reader with 6 Maya classics for $0.99 each! The Mistress Now on Digital Sale! Continue reading The Mistress Now on Digital Sale! Tempted, book 3 in the Pregnancy & Passion series, is now on sale at Amazon in digital format for only $1.99. Are you new to Devon and Ashley? Read an excerpt, and then hurry to order your copy before the sale ends. Maya is excited to announce the reissue of two of her classics for your enjoyment. Are you familiar with Maya’s Wild series? She just reissued the anthology featuring the novellas Golden Eyes and Amber Eyes, with a new opulent cover. Is it new to you? If so, head on over to order your copy. “They called her their Songbird, but she was never theirs. Not in the way she wanted.” Songbird has also been reissued in ebook. Read an excerpt and then order your copy.